These striking screens belong to a category of paintings in the native Japanese style known as 'meisho-e' (literally 'pictures of famous places'). The site depicted here is the Uji River Bridge, an important bridge linking the two historical cities of Kyoto and Nara. A beautiful scenic spot, Uji's features - willow trees, river mists, a waterwheel and stone-filled baskets to protect the river banks - have been celebrated in Japanese poetry since the eighth century, while it also provides the setting for the final scene in the Japanese classic 'The Tale of Genji'. Depictions of Uji are known to exist from the tenth century, and over the centuries the composition became bolder, shedding naturalism and adopting almost geometric stylisation. Sophisticated viewers could normally recognize the literary references from the few visual clues. 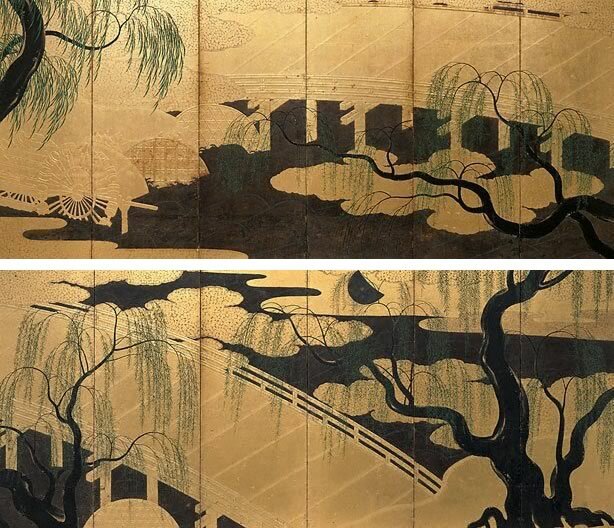 With their contrasts of large, dramatic forms and brilliant metallic shimmer, these spectacular screens represent the zenith of Japanese screen painting during the Momoyama (1568-1615) and early Edo periods (1614-1868), with lavish use of gold and dynamic asymmetrical composition. As a seasonal reference, the passage of time is implied by the changing size of the willow leaves as the viewer moves from right (spring) to left (summer) through the painting. Realism as well as decoration inspired the three-dimensional treatment of the silvered copper moon, now tarnished, and of the water wheels and baskets built up in gesso. Stylised depictions of famous places were popular motifs during the early Edo period and there are a number of other Uji Bridge screens in Japan and America, all depicting the same scene with slight variations - without the moon, or incorporating different seasons, or including narrative details of rice paddies or river boats. However, there are no similar screens in European or Australian collections. Asian Art Department, AGNSW, November 2005. Art Gallery of New South Wales annual report 2006 , Sydney, 2006, 14 (colour illus. ), 15 (colour illus. ).